Had fault code for low maf . Went and had a look at both manifold flaps. When ignition is on 1 side is up and 1 side is down. Is this normal operation? When I start engine it's the same. Can some kind soul maybe have a look to see if theirs is the same. But I suspect faulty left manifold operation as right manifold was replaced at audi a while back. Ps: when engine running and blip throttle 1 goes up the other goes down.kinda. Is this right operation? Correct, at rest with ignition on or off, bank 1 (O/S) is down, bank 2 (N/S) is up. The actuators are identical and can be swapped over. I think you'll find removing the arms will give you an inlet runner code, & I'm a bit sceptical that inlet runners would cause MAF codes?. Who's the most knowledgeable about figures for pump pressures, flow for leak off testing etc on here. Maf replaced. Boosting much better but big cloud of smoke at times. Definitely unburnt diesel. But I'm trying to determine if HPFP is maybe getting old and possible pressure dropping so injectors possibly not spraying properly. Had this on a 530d few yrs back. Replaced pump and car ran like new again. Have done my own leak off tests on 4 cylinder mechanical injectors but v6 us new to me. I have 1 injector that's about 0.5 low but can't get info on stuff like flow rates etc. There are 2 different specs of HPFP. One operates at around 480bar at idle and the other around 230bar (ish). It can supply up to 800bar at idle which is all regulators fully open. If you open the ECU in VCDS, you can log channel 22 and this will show specified fuel pressure by the ECU vs actual measures fuel pressure by the sensor. If it was HPFP or any of the regulators at fault, there is a 95% chance it will show a flashing glow plug light on the dash and throw an error code. Is it sluggish to start when it is cold at all? This is a tell tale sign of leaking injectors. Other than this it could be over boosting due to the turbo going bad. In terms of your original problem of manifold flaps, you can remove them, and fit a small bracket to the actuators to trick the car into thinking they are still fitted. It does a max/min position learn on key on. If the actuator isn’t stopped in a certain position it throws a CEL. no glow plug light. I remember block 22 showing 227bar at idle so that one. Well. Audi were about as good as a fart in a spacesuit. Scanned it and said "there's no faults we don't know what to do !" Are you ****** serious haha. So they never charged me.I went to collect car and got 30ft out on rd and car has a stumble at idle. This HAS to be injector/s. 1 is making up on smooth running by nearly 2gm per stroke to compensate for previous faulty 1 or 5! But it's pissin me off as to why it's now developed a mis when it didn't when I left it with audi. Think I'll so leak off test tomorrow. Can anyone tell me how these particular leak off connectors come off? Not familiar with these and cant afford to break any. Are you referring to the return to tank line? You pull up the end of it, the whole fitting will then pull off the injector, it’s quite hard to explain. 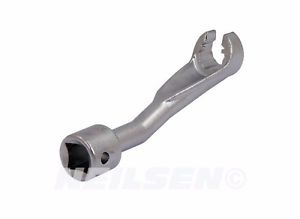 You will need a 14mm fuel line socket to get the HP fuel lines off. How to you plan to test them? If it were me I would remove all the injectors and send them to a diesel injection place for testing. Fuel line socket? Did my beemer injectors last year didn't need special socket. There was enough of the flat to get grips to wiggle em out while spraying penetrating fluid. I HAD planned on doing test on all 6 to see how much leak off I get at idle for 1 minute. Then higher up rev range for another minute. Looking online to see figures for leak back at idle etc but can't find anything so far. Might actually send them to diesel specialist on Monday .not sure yet. But as my problem is mostly at idle I think I'll find which is far out of spec no? The injectors then have a fuel return line (item 8 below) which has a regulator in it (item 9 below). I believe there are several different specs of regulator (6bar, 8bar, 10bar) depending which injectors and fuel pump you have. If this back pressure isn’t correct the injectors won’t work properly and will most likely throw other error codes. items 21 and 24 are the fuel feed lines to the injectors. It’s the injector end you need the socket for. All the hardline fittings should be torqued to 25Nm when refitted as well. Ok that's some great information. I suppose if I end up sending them off to be tested the specialist can also test those regulators if I take that with me. The company is pattersons diesel in Cowdenbeath.scotland. Very good company who are Bosch and Siemens approved. Their bench testing machines are something else. Used company before. Knows his stuff. Anyway,what diagrams are those? They look easy to understand. Did you pay for it? Is it an app or download? Could do with that. PM me your email, they are ELSAwin (Audi Service) documents and I will send them over. You can’t remove the regulator from the lines, you also can’t buy the return line and regulator on its own, even though it has a pet number. I busted one of the return fittings when removing mine. I managed to get a used return line off eBay though and worked fine. After the regulator it feeds back into the fuel inlet line which goes to the HPFP. It goes into a Y banjo and mine was just push fit, you just have to pull, quite hard, to get it off. In terms of removing injectors, mine had been in there for 167,000 miles and my car is a 2005. I undid the small retaining bolts and they fell out. No where near as hard as some other engines where as you say you can lift the whole car before they come out! I'll pm you my email. Thanks you been a terrific help.